The mysterious transit of the soul to the afterlife, soothing wounds, collective bereavement, inscriptions in sound and song of thought that words cannot express: These subjects and more are beautifully brought forth in a somber, stirring, sepulchral 40-minute interactive performance, “An Occupation of Loss,” organized by artist Taryn Simon in the vast darkened drill hall at the Park Avenue Armory (and being staged ten times nightly, now through September 25). 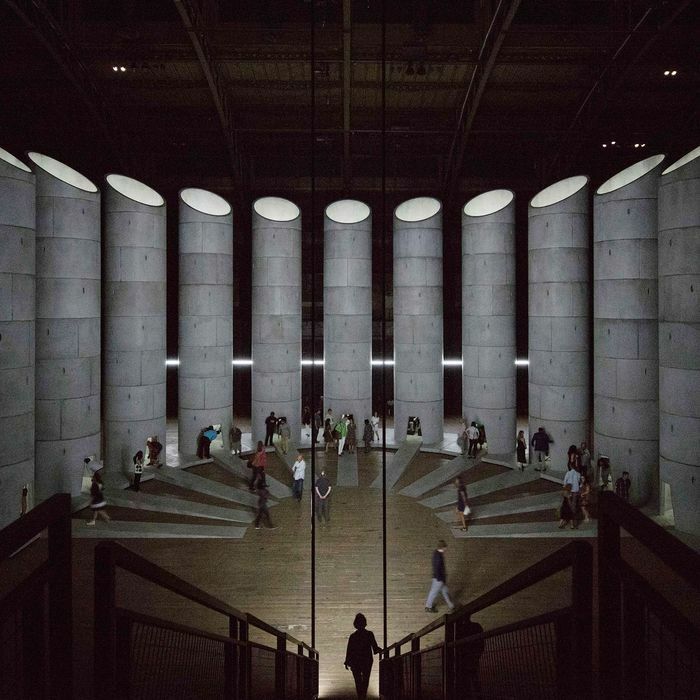 After being admitted through a side second-story entrance, 50 or so viewers descend a long staircase to see 11 cement silos or circular towers almost 50 feet high, opened at the top and arranged in a semicircle. It’s like a giant pipe organ. Long ramps lead to a slightly elevated oblong opening at the foot of each tower. Viewers may duck inside. There, in intimate quarters usually seated on a bench, are professional mourners from 11 different countries, including Albania, Azerbaijan, Ecuador, and Ghana. There are people in robes, gowns, full body wraps, giant masks, or altogether covered in black. All somehow ceremonial, ritualistic, liturgical. Fight off Simon’s highly staged theatricality and control-freakishness; set aside all the operatic imperiousness and thoughts of astronomical budgets to build all this and bring this global group together. What might sound hokey, exploitive, excessive, or merely anthropological instead whispers deeper meaning and the presence of importance and the archaic. In the beginning I watched from outside, afraid to go in any of the towers. Finally, I ducked into one. And was shaken. I stood alone with a woman seated on a bench as she cried, tears running down her cheeks, rocking back and forth, thumping her thigh, moaning, singing, and speaking words I couldn’t understand. I knew this was a universal language of loss and inconsolability. I heard these sounds come out of me only once in my life; when I stood on Ninth Street and Fifth Avenue and wailed as I watched the first tower fall on September 11, 2001. At the Armory, I listened to this woman, saw that she grasped an American-flag handkerchief, and made out what sounded like the words bibi and something like niente — words I took to mean baby and nothing. Death. I moaned, looked down, felt embarrassed for being a spectator while she was in an insatiable world of pain. Later, I learned she was a dirge singer from Ghana. Time stopped. I had similar experiences inside every silo. When I tried to go inside one with two veiled women dressed in black I was told by an attendant that “these women mourn only in the presence of women.” Many of the mourners were women. As we’re brought into the world with screams we are ushered out here by other women making other sounds. Rituals like these are meant to shepherd the soul to other incarnations, ward off demons, comfort the dead, console the living, perform ancient rites, recount heroic deeds, level karmic forces, recite prayers, lament, and usher a body back “home” to their cosmic collective family. Being a professional mourner is a higher calling. Yet it also comes with the stigma of being marginalized. Indeed, the Cambodian musicians here playing ceremonial songs played only as the soul is leaving the body, were forbidden to practice at all or put to death during the Khmer Rouge’s reign of terror. The mourners here from Russia, Albania, Romania, and other countries were forbidden to practice as well. This oppression of proper burial is as old as our first stories. In the Iliad Priam steals into Achilles’ tent begging for the body of his dead son Hector, whom Achilles has dragged in the dirt for days. Without proper burial and mourning there is no eternity. No peace. Somehow at the Armory this intense listening in the dark releases sorrow, absolves, soothes wounds. In its very stylized yet direct, circumspect, respectful, and guttural way Simon’s warbling choristers and companion-priests open doors for us soon-to-be travelers, letting us feel the pulse of things bigger than we are, yet things we are composed of.